This is presidential power in its rawest form, revealed alongside the private vulnerabilities of the world's most public man. Thrust into the presidency by the assassination of John F. Kennedy, Lyndon Johnson immediately confronted the twin challenges of leading a nation in mourning while ensuring the continuity of government. 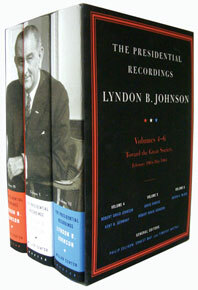 As one of his first acts, Johnson ordered a secret taping system installed in the White House and began recording his telephone conversations. This three-volume boxed set continues the University of Virginia's Miller Center of Public Affairs's acclaimed Presidential Recordings series, covering the time period between February 1, 1964, and May 31, 1964. During these dramatic months, LBJ launched his War on Poverty, questioned the viability of the U.S. policy in Vietnam, and deftly managed the progress of a historic civil rights bill through Congress.